Following last week's arrest of Arafat Nagi, the executive director of a group called Western New York Muslims (WNYMuslims) gave an interview to a local (Buffalo) news program. WNYMuslims appears to be tied to Muslim Brotherhood adherents and organizations. 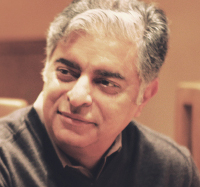 Its founder, Faizan Haq, is a member of the Safa Group, a/k/a the SAAR Foundation, an organization with Muslim Brotherhood ties that is suspected of fundraising and/or money laundering for terrorist groups. Haq is or was a board member of Islamic Society of North America, a Muslim Brotherhood front that was an unindicted co-conspirator in the Holy Land Foundation terrorism financing case and has admitted having ties to the Hamas terror organization. As WNYMuslims noted on its website, Haq spoke at the 2013 convention of the Islamic Circle of North America (ICNA), another Muslim Brotherhood organization, that has been probed by the FBI for ties to terrorism. WNYMuslims also participates in ICNA social events. 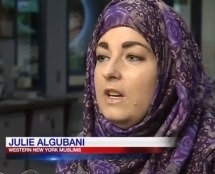 WNYMuslims executive director Julie Algubani. During her interview, the group's executive director, Julie Algubani, insisted "the Lackawanna community in no way, shape, or form wanted any of this to happen and this is not the norm." Presumably, by "Lackawanna community" she means the Muslim community in Lackawanna, but it is revealing that she does not say so. She then pivoted to the victimization of the Muslim community. "Algubani told News 4 stereotyping is not a new obstacle for Muslims, and she hopes the arrest doesn't create new tensions. 'Unfortunately because Islamophobia is so strong, we are, you know we recognize that it's so strong. And unfortunately it's something that as a Muslim in the community we have to deal on a daily basis whether something like this happens or not,' she said." Because obviously that's the real issue raised by the arrest of Nagi, a would-be ISIS recruiter who had acquired military gear, had access to an assault rifle, and previously threatened to behead his own daughter: imminent Islamophobic victimization of the Muslim community.